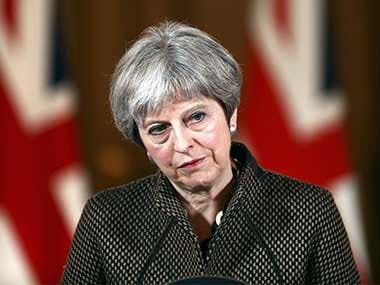 London: British Prime Minister Theresa May’s Conservative Party began gathering for its annual conference on Saturday with bitter divisions over her Brexit plans rising to the fore, raising doubts about her own future. Britain is due to leave the European Union on 29 March, 2019, but the terms of the departure remain unclear. May, under fire from critics in Brussels, opponents at home and some lawmakers in her own party, has said talks on a divorce deal are at an impasse. In an interview with the Sunday Times newspaper ahead of her party’s conference, May took aim at those who have scorned her “Chequers” Brexit proposals accusing them of “playing politics” with Britain’s future and undermining the national interest. However, in a demonstration of the challenge she faces, the newspaper ran an interview with former foreign minister Boris Johnson alongside on its front page in which he openly questioned May’s commitment to Brexit and called her plans “deranged.” “Unlike the prime minister I campaigned for Brexit,” said Johnson, the bookmakers’ favourite to succeed May who on Friday declined to answer directly whether he would rule out a leadership challenge. Japanese carmaker Toyota on Saturday warned that leaving without an agreement would hit its production and jobs would ultimately be at risk. “Of course we want a deal,” Business Secretary Greg Clark, one of those who supports May’s plans which seeks the free trade of goods with the EU, told BBC radio. A summit of EU leaders last week ended in a blunt dismissal of May’s proposals, which they said would fail to resolve arguments over the land border of Northern Ireland, in the UK, with the Irish Republic, in the EU, one of the main sticking points to a deal. Britain’s Brexit Secretary Dominic Raab said the Irish issue was being used by some in the EU Commission “for political purposes”, but said he was open to suggestions from the bloc. As Conservative lawmakers and party members began arriving in Birmingham, central England, for what is expected to be a fractious party conference which starts on Sunday, many have said the Chequers plans are dead and should be torn up. While May and government ministers continue to express confidence that a final Brexit deal can be agreed, they have also insisted no-deal would be better than a bad deal. However, Toyota became the latest high-profile business to warn that leaving the world’s biggest trading bloc without any trading agreement could add costs and cripple output at plants which rely on the just-in-time delivery of tens of thousands of components. “If we crash out of the EU at the end of March the supply chain will be impacted and we will see production stops in our factory,” said Marvin Cooke, managing director of Toyota’s Burnaston plant, which produced 144,000 vehicles last year. Earlier this week other carmakers in Britain including BMW, McLaren and Honda said they had triggered some contingency plans, such as certifying models in the EU, redrawing production schedules and stockpiling parts.